By utilizing our years of experience, we bring forth a qualitative array of Semi-Automatic Carton Sealing Machines that are highly efficient and reliable as well. Offered sealing machine is developed by vendor’s professionals in fulfillment with quality standards using finest quality material and sophisticated technology. 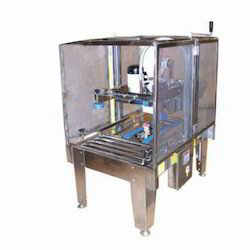 This sealing machine is inspected on numerous parameters for ensuring its flawlessness. 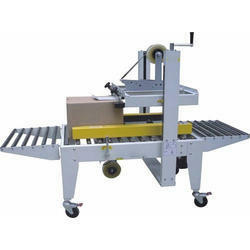 We are giving this sealing machine to customers in a committed time period. Length: 0.5 Meter or 1 Meter. Tapping heads for 63.5 mm (2.5) or 76.2 mm (3”) BOPP Tape. 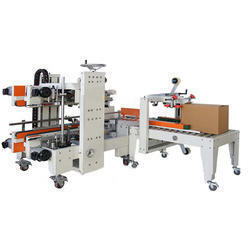 Owing to our expertise in this field, we are providing Fully Automatic Carton Sealing Machine. Our offered sealing machine is manufactured with excellent grade material keeping in mind the market norms & has inbuilt tool box for ease of maintenance. The sealing machine offered by us is checked on varied parameters for supplying fault free range. Furthermore, customers can avail this sealing machine in different specifications as per their needs. Idle roller conveyor, which acts as a buffer between the machine and the carton collecting station. The Bottom Sealer is the ideal alternative to manual bottom taping. The plate can be provided as an option. As a perfectionist in this field, we are offering Semi-Automatic Electric Carton Sealing Machines. The offered sealing machine can be easily moved to any point on the factory floor or placed at the end of the packaging line. Our given sealing machine is designed by vendor’s competent professionals using finest grade material & latest techniques in accordance with the industry norms. 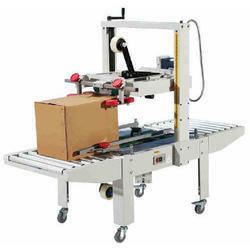 This sealing machine is tested in terms of quality for dispatching a flawless range. ITW signode India's 2AM, 4AM and 6AM carton sealing machines are indigenously developed and are reliable solution to meet the gamut of your carton sealing needs. Any box ratio approaching this limitation should be test run to assure performance. The machine’s performance depends on the quality of carton,tape and material fitment in carton. Versatile Semi Automatic Carton Sealing Machines is equipped with flexible tapping head and operates in reliable manner for years. 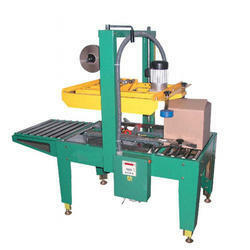 We offer this sealing machine in number of specifications as per the needs of customers. The offered sealing machine is developed at vendor’s work place under the direction of our professionals using the quality material and leading technology. Our organization is standout provider of Carton Sealing Machine to our clients. This sealing machine is offered in best range to our clients. This machine operates in reliable manner and is able to give best performance for years. This machine finds application in sealing and is proven for its reliability and hassle-free operation. This machine is offered to our clients in both customized and non-customized options.